Description: Almost 1500 sq ft of gorgeous flagstone patios and walkways have created an outside paradise worthy of year round enjoyment! Brazilian cherry wood floors in family room! Impressive rock fireplace with custom mantel and gas! Ge profile gas stove, corian counters, 42 in cabinets! Silk window treatments & blinds! Asphalt tile w/baseboard in oversized garage-room for golf carts! 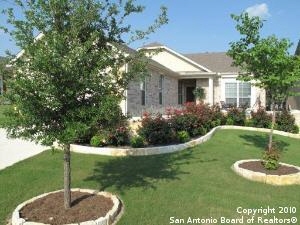 Majestic oaks, outdoor buffet with sink, covered patio and landscape lighting! The perfect texas hill country atmosphere! Awesome!